Coutinho started Liverpool UEFA Champions league game yesterday with the captain armband for the first time in his Liverpool career. With Jordan Henderson, James Milner and Simon Mignolet all starting from the bench, Jurgen Klopp has to pick Coutinho has the captain of the night based solely on who was the longest serving player. 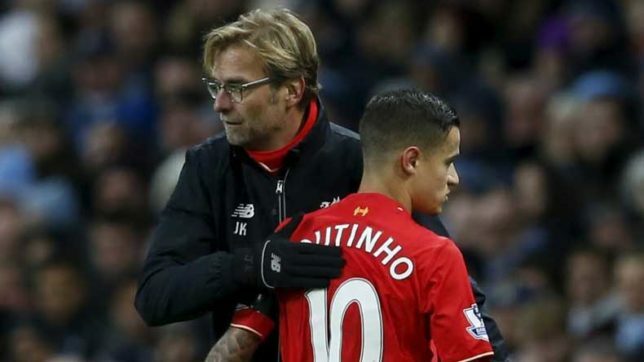 Klopp says Phil Coutinho was made captain against Spartak Moscow because he was the longest serving player at the club in the starting XI. The former BVB manager claimed his decision was based on which starting player had been at the club the longest which he did through Google. The Brazilian repaid the manager faith in him by scoring an hat-trick which is his first in the club since he arrived in 2013 from Inter Milan. However, many fans believe the decision was to help convince Coutinho to stay in the club, with Barcelona still eyeing the prolific midfielder.